Human chain to protect Khowai River. A human chain was organized jointly by Khowai River Waterkeeper and Bangladesh Paribesh Andolon (BAPA), Habiganj Branch demanding for eviction of illegal occupancy, the excavation of river Khowai and repairing the damaged embankment of river immediately to protect the river Khowai and people of Habiganj. The human chain held in front of Saifur Rahman Town Hall in Habiganj on 23 June 2018, Saturday. Due to the Chakmaghat Barrage in Tripura, India; Khowai doesn’t get enough water during the lean period. But on the other hand the open gates of the barrage during monsoon causes floods and erosion in the lower riparian area in Bangladesh. Illegal encroachment, unregulated sand mining and pollution to the river in Bangladesh are further aggravating the situation. The flood control embankment and riverbed of Khowai are not well taken care of for long that has put the district headquarter of Habiganj in serious threat of being flooded in recent years. To protect Habiganj town from waterlogging, it is important to recovery the old channel of Khowai and connect Machuliya to Gorurbazar part with the main flow and wetlands by sluicegates to turn this to a beautiful water body from a narrow drain. 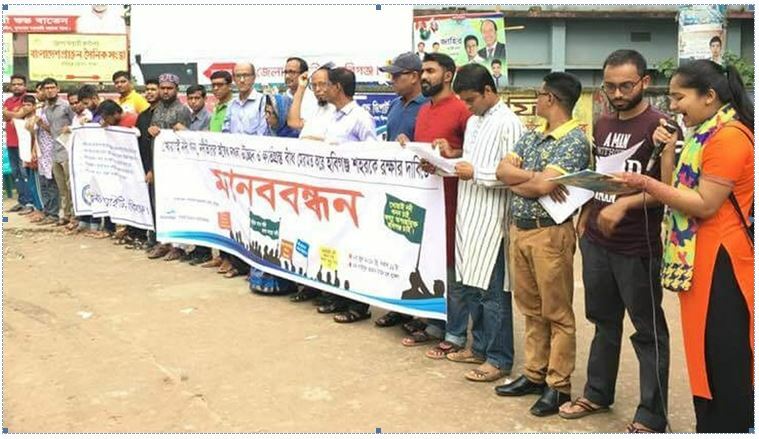 The human chain was presided over by Professor Iqramul Wadud, President of BAPA, Habiganj Branch while Aminul islam, volunteer of Khowai River Waterkeeper moderated the event. Among others, Vice President of BAPA Advocate Monsur Uddin Ahmed Iqbal, Writer Tahmina Begum Gini, Asst. Governor Rotary Dist. 3282 Tabarak Ali Laskar , Advocate Bijon Bihari, Dr. S S Al-Amin Summon , Advocate M A Kaiyum, Abdur Rakib Roni and Nahida Khan Surmi spoke in the occasion. At the beginning of the program, Nahida Khan Surmi read-out the written statement of Tofazzal Sohel, Khowai River Waterkeeper , where five demands were put forward to the government to address immediately.